4-5 minutes walk from Waterloo Tube station, which is on the Northern, Jubilee and Bakerloo Lines. Waterloo mainline station is also just 4-5 minutes walk. Opening hours: Open Monday - Wednesday, and Friday 10am to 5pm / 7pm. Thursday 11am - 5pm. Saturday and Sunday 10am to 6pm / 7pm. Closed 25th December. Pick up point: Please take your voucher to the Group Entrance along with your photo ID for priority entrance to the London Dungeon. Once your voucher has been exchanged, you will be issued a timed ticket on the next available tour with a guaranteed entry time. This is usually within 45 minutes from arrival, however at peak times there may be a longer waiting time. There will also be the opportunity to request a later time if the allocated time is unsuitable.IMPORTANT: This is a ‘Voucher’ and not a ‘Ticket’. Please take your voucher and redeem it for a timeslot/ticket to enter. It is recommended that at Peak Times and weekends you should exchange your voucher for a pre-booked timeslot as soon as possible to avoid disappointment. Important info: Disabled Access: All the dungeons have wheelchair access, however some of the rides are not suitable for wheelchair users.You will need to exchange your voucher upon arrival and you will be issued with a timed ticket. Once the tickets have been issued, you will need to come back to the attraction at the time shown on your ticket to join your London Dungeon tour.You will be allocated a space on the next available tour and it is guaranteed to be within the next 45 minutes.You will also have the option to request a later time if the proposed timeslot does not suit your day’s plan and you would prefer to visit at another time. IMPORTANT: This is a ‘Voucher’ and not a ‘Ticket’. Please take your voucher and redeem it for a timeslot/ticket to enter. It is recommended that at Peak Times and weekends you should exchange your voucher for a pre-booked timeslot as soon as possible to avoid disappointment. Delve into the ancient capital’s most horrible history at the London Dungeon experience live actors, 3 thrilling ride and exciting special effects. Step back into the darkest of times and face your fears head on in this unique experience. Everything that you see is based on real historical events from Jack the Ripper, to the Great Fire of London, torture and the plague. With 3 scary rides the London Dungeon provides a thrilling and fun experience that will leave your family screaming for more! MeetSweeney Todd, the demon barber of Fleet Street -a short back and sides (1785-style) could be just the thing to round off your visit. but will you get more than you bargained for? Keep your wits about you to make sure you don’t become the next filling in Mrs.
Lovett’s famous pies! 1888, and the fear rises inside you as you enter Jack the Ripper’s Whitechapel. As you wander the stinking slums the true horror of his terrible crimes is revealed. Then a scream, the flash of a cloak and an evil smile as you come faceto face with Jack the Ripperhimself. will you survive? Experience a Victorian séance gone wrong on Vengeance: the UK’s first 5D laser ride. As you spin around in the darkness, can you duck, dive, dodge and shoot your way out? A high speed, high adrenaline ride, this is the ultimate ghost hunt with you at the heart of the action. 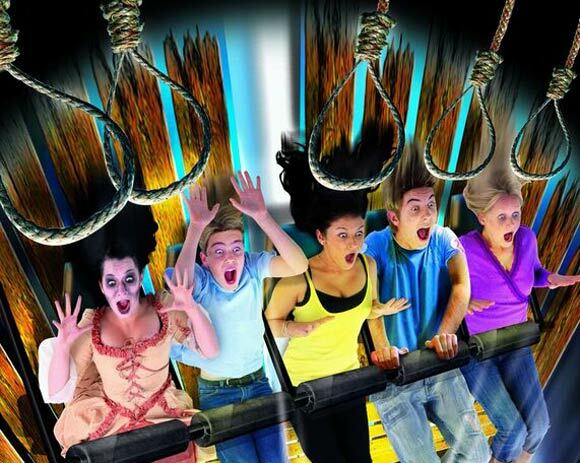 Finally, embark upon your last journey on Extremis: Drop Ride to Doom! At the mercy of the hangman, you are at the very point of death and the end is drawing near. Taste the fear and feel the adrenaline pump as the trapdoor opens and your heart shoots into your throat as you drop, screaming into the darkness below. Mon, Tue, Wed, Fri, Sun: 10am to 5pm (last tour)	Saturday: 10am to 6pm (last tour)	Thursday: 11am to 5pm (last tour)	To Note	The attraction opens everyday at 10 am except Thursdays.